Until today, the worst result in a World Cup semi-final had been a three-way tie at 6-1. In 1930, both semifinal matches ended at that scoreline, with Argentina smashing the U.S. and Uruguay demolishing Yugoslavia (the games were 1-0 and 3-1 at the half, respectively). A quarter-century later in 1954, Germany thrashed Austria 6-1 in the semifinals in Switzerland. We say the semis, because there have been some truly ghastly blowouts in group play, where teams that have no business in the World Cup go up against the giants. And in 1938, Sweden laid the worst beating in knockout round history on Cuba, 8-0. There have also been more drastic results in years when the tournament format wasn't in bracket form, like when Brazil won 7-1 and 6-1 in the "Final Round" in 1950, when the World Cup was held in Brazil, but that hardly seems drummed-up and mean-spirited enough to unfairly pile on with here. So good job eating it, Brazil. For the game, the Germans put 12 or 14 shots on goal, scoring on seven, and only conceding in the 90th minute, essentially out of pity. Brazil finished with more shots (18) and possession (52 percent to 48) and a better passing percentage (86 percent to 84), but that's a heavy, heavy artifact of score effects. After the first goal, this was all the Germans. 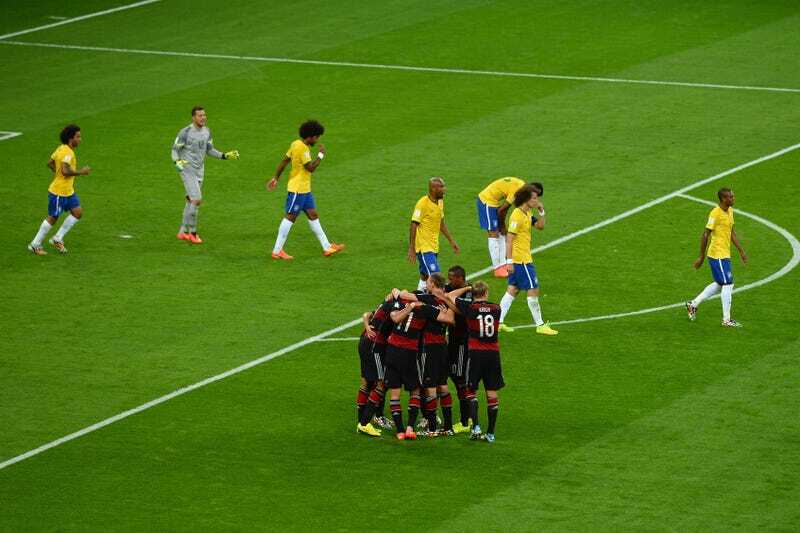 This was Brazil's first home loss in a competitive—"competitive"—game since 1975. It's also the nation's worst ever loss in international play, and the day also saw Miroslav Klose overtake Ronaldo for the all-time lead in World Cup goals. Seven goals is the most ever scored in a World Cup semifinal match. Brazil have only conceded seven or more goals once before, losing 8-4 to Yugoslavia in 1934.